Armed with more than 30 years of industry experience, Richard Anderson assumed his role as CEO of Horizons Residential Care Center on June 1, 2017. "He has hit the ground running and is meeting all staff. Richard is passionate about providing quality care for residents and about engaging the community with both Horizons' past and its future," stated Horizons in a recent website posting. 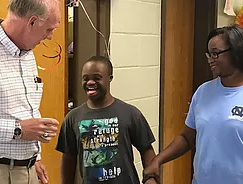 "I find myself at Horizons; a wonderful, loving, and compassionate place, with an employee family that cares not only about our resident family, but about each other as well," said Anderson. "It is a Mission that has been cherished and nurtured for over 40 years and we will honor that legacy as we write the next chapter. We will work to immerse our Horizons family into the greater Winston Salem community. As such we will participate in community festivals and civic activities." The hire was the result of a CapDev CDS ("Candidate Discovery & Screening") search conducted earlier to provide a well-vetted and qualified candidate pool for the search committee to use in selecting its finalist candidates for the position. Read more about CDS here.